Regular Business Hours are Monday through Friday, 8 am to 5 pm. 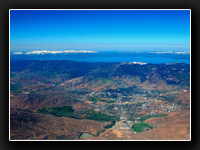 Our business phone number is 775-883-7770. You can fax us at 775-883-7737. Our email address is info@ctar.us. 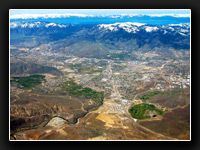 TOWING: If you need AFTER HOURS TOWING please call Capital Tow (for Cars & Pick Up Trucks) at 775-882-8260 or Valley Towing (for Cars, Trucks and Motor Homes) at 775-882-3800. Your privacy is important to us. We do not sell or share information about our customers to outside parties except as necessary to complete repairs, collect payments, provide warranty service or provide a service you asked for. We will not sell your email address or other personal information to any one for the purpose of sending you unsolicited advertising. The information provided on this website is provided for informational purposes only and in "as is" condition without any express or implied warranty of any kind regarding accuracy, completeness or applicability. This website is constantly being updated; we reserve the right to make changes without notice. 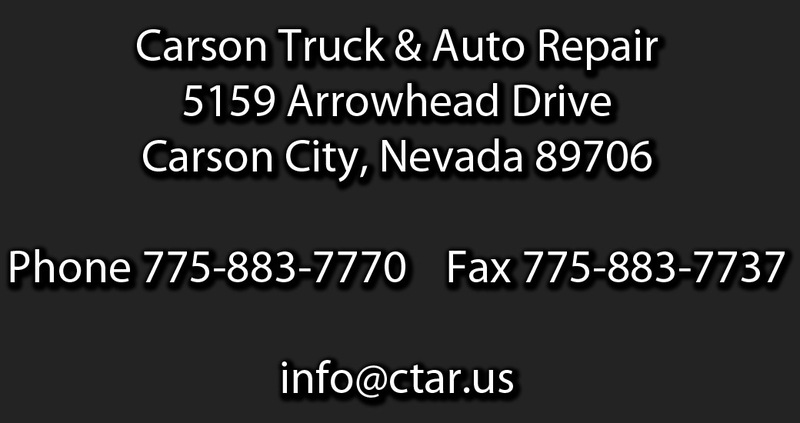 In no event shall Carson Truck & Auto Repair be held liable for any damages whatsoever that may arise from use, misuse, or inability to use the materials provided on or through this site. For information regarding this website or to report an error please contact us at info@ctar.us. New Vehicle Warranties, Important Information. New vehicle warranties are getting longer and longer. This is great news for consumers. There is a down side, however, more and more warranty repairs DECLINED by manufacturers and extended warranty providers due to failure to follow or document required maintenance and servicing. 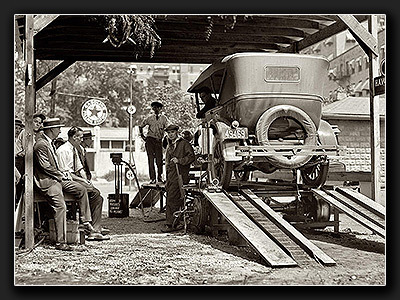 Make sure you never exceed the manufacturers recommended service intervals. Also, be aware that many extended warranty companies have servicing requirements that are stricter and more frequent than the OEM’s requirements. If you are not sure what servicing you should be doing ask us or check your owners manual. 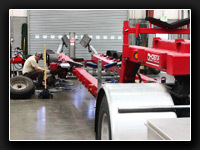 We will service your vehicle to factory specifications or better. 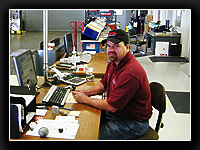 Warranty Repairs, Factory Warranties and Extended Warranties. 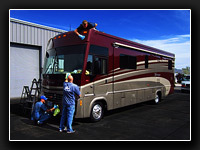 As a service to our customers we do Motor Home Repairs that may be covered under warranty. 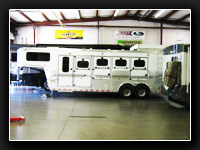 A warranty may be provided by an Original Equipment Manufacturer (OEM), a Chassis Manufacturer (Ford, GM, Monaco, Spartan), a Coach Manufacturer (Workhorse, Winnebago. Monaco), a system or accessory manufacturer (Aqua Hot, HWH, Norcold), a part manufacturer or an Extended Warranty Coverage provider. 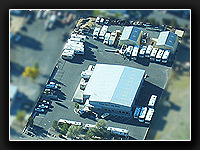 Often we will handle all of the paperwork and billing for you. Sometimes you will have to pay us for the repair and seek reimbursement from the company offering the warranty. In all cases you are responsible for all charges incurred until paid by the company offering the warranty. We cannot release any vehicle before all charges are paid. You are also responsible for all charges for diagnosis and inspection whether or not the problem is covered by a warranty. Inspections are not free; there is a one hour minimum charge. This also applies to Extended Warranty Coverage and warranties offered by third parties. Customer remains responsible and agrees to pay for any claims denied for any reason. 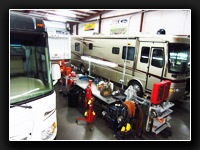 In the event your Motor Home Repair is not covered by a warranty you are responsible for all charges for inspection and diagnosis, road testing, etc, even if you choose not to do the suggested repairs. Extended Warranty companies usually will not pay for any inspection, diagnosis or disassembly until a failure is found that is covered by their policy. You must authorize and agree to pay for all work to be performed including inspection, road test, diagnosis, disassembly and reassembly charges before we can begin work. Any promises to pay made by an Extended Warranty Company or other third party are between the Customer and the Extended Warranty Company. Extended Warranty companies also frequently send an adjuster to inspect your complaint and verify the recommended repair. Any time spent by us to accommodate their requests is your responsibility. Payment must be made before release of vehicle. Some Extended Warranty companies will pay us directly with a credit card, and you can be on your way as soon as repairs are completed. Some will not; in that case you will need to pay all charges in full and then get reimbursed from your Extended Warranty company. Please understand that warranty repairs require certain procedures to be followed and that extra time may be required to complete your repairs. Therefore, we can make no promises on a completion time for your job. We will, however, always do our best to get your job done as quickly as possible.